Have you ever noticed that we often see whatever we’re looking for? The wife who gets annoyed when her husband leaves his things laying around – she sees the 3 items he left out after work but she doesn’t always notice the 7 things he’d put back away. The child who thinks his parents are too over-protective? He might forget about all the things he is allowed to do. Because sometimes all he wants to think about is the one thing he isn’t allowed. 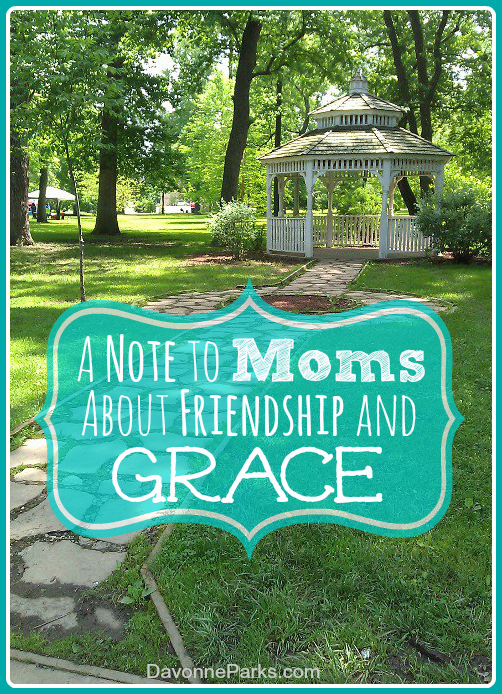 The mom you think is too permissive? It’s easy to overlook the 20 things she did right today and instead focus on the one time she went too easy on a child who disobeyed. When a young woman is dating, she may not notice all of the red flags in a man’s temper because she’s blinded by her infatuation. Or a mom may ignore the warning signs regarding her child’s sin because she doesn’t want to believe that her child is facing an inward battle. Without even realizing it, we often see what we want to see, instead of what’s really there. From now on, let’s choose to see with grace. And with love. But also with reality. Know that the permissive mom is doing her best. The strict mom is as well. None of us have the perfect balance. We all fall short at times. We all need to receive grace. The mom choosing to homeschool? She’s doing the best job she can. The mom who sends her kids to public or private school? She’s doing her best too! And the mom who chooses to hug her kids and talk lovingly to them when they do wrong – why is that better or worse than the mom who puts a child in time-out? Isn’t it possible that both of those things are good? Why do different parenting styles have to become a battle? Don’t different children need different things, just as we adults don’t all need the exact same things? Yes, let’s take the blinders off. But also know that everyone – our friends, our spouses, our children, the stranger at the grocery store – they could all use a little more love and grace. Let’s love well and extend grace liberally, but also keep sight of reality. Great post! Too many times moms spend more time judging each other instead of looking past differences and cultivating friendships.